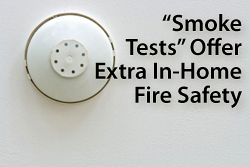 Make sure that your home and family are protected by testing your home’s smoke detectors. Many times during Atlanta Home Inspections, the Atlanta Home Inspector will find smoke detectors placed within the home, but without proper battery charge. An estimated 356,000 in-home fires caused more than $7 billion in U.S. residential property damage in 2009, according to data from the United States Fire Administration. The fires caused more than 12,000 injuries, and killed more than 2,500 people in Atlanta and nationwide. Unfortunately, many of affected homes did have smoke detectors — they just weren’t working properly. This is why it’s critically important to test your home’s smoke detectors at least once annually. When you test a smoke detector, you’re making sure that the alarm will trigger in the event of a real-life fire. A proper test will confirm that the batteries have useful life, and that the device’s smoke detection components are operating as expected. You can also take your test a step further. Just because the smoke detector’s alarm can be heard from the farthest point in your house doesn’t mean that the alarm will sound in the event of a real fire. Therefore, you may want to buy a “smoke test”. Smoke tests are aerosol cans that simulate a bona fide in-home fire. You can buy them for less than $15 at your local hardware store, or at Amazon.com. If your smoke detector fails to sound its alarm in the presence of a “real fire”, make sure you replace it right away.